Garibaldi Provincial Park, in British Columbia, Canada, encompasses 195,000 hectares of widerness filled with mountains and glaciers, lakes and rivers and impressive forests. Much of the landscape surrounding Garibaldi Lake was formed by recent volcanic action. Most regions of the park are accessible only by mountaineers and cross-country skiers although there are five areas with visitor-oriented facilities. World famous Whistler and Blackcomb Ski Mountains are located near the park. Forest cover consists mainly of Douglas fir, western red cedar, western hemlock, birch, alder, and cottonwood. Mountain hemlock, yellow cedar and alpine fir grow in higher elevations. Wild flowers such as lupine, Indian paintbrush, snow lily and arnica blanket the alpine meadows. An abundance of small mammals and birds frequent Garibaldi Provincial Park..
An easy drive from Vancouver, BC, a number of access roads along Highway 99 between Squamish, Whistler and Pemberton lead to various park entrances. Squamish is the closest town to the park. The five visitor facilitated areas within the park include Diamond Head, Black Tusk/Garibaldi Lake, Cheakamus Lake, Singing Pass and Wedgemount Lake. 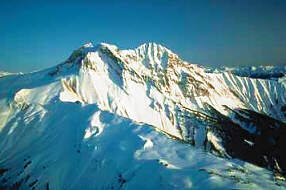 This area is located in the southwestern portion of the park and includes Mount Garibaldi. Extensive hiking, mountain biking and cross-country skiing trails lead to the areas notable features. Rainbow trout are resident in Mamquam Lake. A day shelter with a propane and wood stove and an overnight shelter with 34 bunks, wood and propane stoves are located in the vicinity. Designated wilderness camping areas with tent spaces and toilets are provided. This area is located in the heart of the park encompassing attractions such as the Black Tusk, Panorama Ridge, Helm Glacier, the Sphinx, Castle Towers and Garibaldi Lake. The area is popular for mountaineering as it offers challenging peaks for climbing. Extensive trails lead through a forest of Douglas fir and western red cedar. Rainbow trout is the principal species in Barrier, Garibldi and Lesser Garibaldi Lakes. Designated areas for camping provide cleared tent spaces and pit toilets. There are two day shelters available. This thickly forested area is popular with anglers and those wishing to relax in the peaceful lakeside setting. An easy trail leads through the area to a steel bridge crossing. There are wilderness camping areas located near the west end of the lake. Extensive trails lead to various vantage points where magnificent views of the surrounding area are possible. Wilderness camping is permitted and a hut is located near the northwest end of Russet Lake. This glacial lake is surrounded by Wedgemount and Armchair glaciers. Trails lead to designated wilderness camping areas and a shelter.